Golf with us at Galveston’s premier golf course! The Moody Gardens Golf Course features a $16 million renovation by the renowned golf course architects of Jacobsen Hardy Golf Course Design. New turf grass, elevations, drainage, irrigation, green complexes, and cart paths were all included in the renovation. The clubhouse also had a full makeover! The playing surfaces are kept in top condition with a new irrigation system and water treatment system. The high quality water makes for a high quality course. Along the 18 holes, golfers will experience lowland native areas, natural wetlands, and over 500 palm trees, creating the famous tropical feel. This first-class public golf course is open seven days a week for local residents and visitors to the island. Not only are the course and clubhouse renovated but other new amenities include a larger driving range, a new golf cart fleet, and a remodeled pro shop. After a nice round of golf, guests can enjoy a meal on The Pelican Grille’s clubhouse patio. The Moody Gardens Golf Course is a great way to spend your vacation by the water without having to worry about the hassles of getting to the beach. You won’t encounter crowded beaches, kids running around, or have to worry about the temperature of the water. 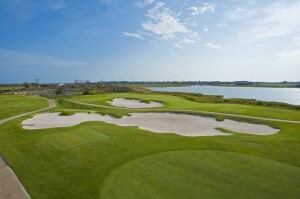 Swing your club, feel the cool sea breeze, and enjoy the scenery of the Gulf Coast. Tee time at the Tropical Golf Course is the perfect addition to any vacation. Don’t miss out on our special offer at the Moody Gardens Golf Course. For a limited time you can receive a free cart and bucket of range balls with the purchase of a round of golf! Make your next weekend trip to Moody Gardens, and enjoy a round of golf in Galveston. When you aren’t swinging clubs on the course, take advantage of our special deal at the Spa at Moody Gardens in the Moody Gardens Hotel. When you buy one Swedish massage, you’ll get one free!